What the hell is Nexus North and why should I care? Several people were asking themselves that question while watching the proceedings at last night's regional council meeting, the last before our summer break. It's a fair question. 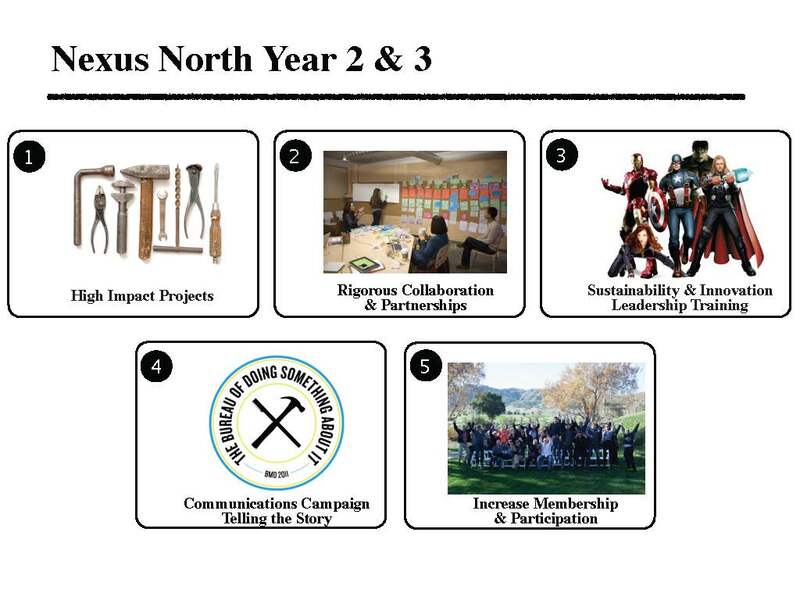 Let me say right off the top, that there are few things that have me as excited and optimistic as the Nexus North initiative. That said, I understand the puzzled looks, the pain-in-the-brain, the twisted eyebrows trying to wrap your head around what it is. 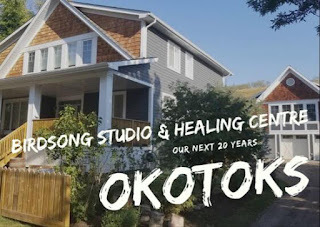 I shared in chambers last night that it reminded me of the cognitive conundrum I face each time I'm asked about my wife's work with craniosacral therapy. After many salubrious attempts, each of which fell completely short of the mark, I finally asked her what words I should use to explain this healing modality that has her so excited. "It's light healing touch, somewhere between deep tissue massage and energy work." "Oh," I said. "Well that makes total sense. But what do you mean by energy work?" She told me. Now, I'm in a much better place to not only understand her work, but to communicate it to others. We were first exposed to the Nexus North initiative in November, when Seth Goldenberg (Epic Decade) and Don Simpson (Innovation Expedition), co-leaders of the project, appeared in front of regional council for the first time. It was an emotion-filled and passionate discussion that ensued, which left a measurable impression on the entire Nexus North team that was in attendance that night. 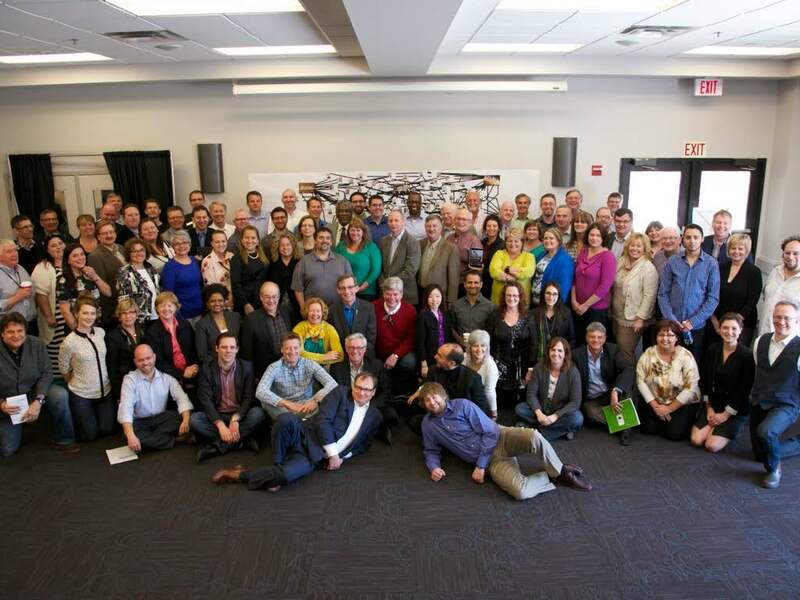 I had the honour, along with several of my council colleagues, including Mayor Blake, to participate in the two-day think tank that was dubbed as the "Design Lab". 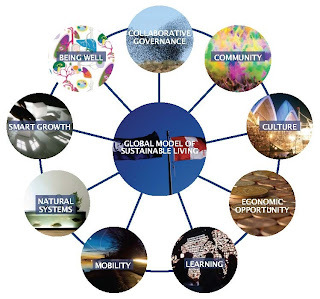 Broken up into the nine frameworks - Collaborative Governance, Community, Culture, Economic Opportunity, Learning, Mobility, Natural Systems, Smart Growth and Being Well - the roundtable discussions were fascinating, complex, frustrating, and illuminating. The relationships established, with world-class thinkers from across North America, are priceless. The cloudy, elusive, ethereal nature of Nexus North will start to coalesce in 2014 and 2015 as the consortium, which includes major players from Nexen, ConocoPhillips, Suncor, Statoil and contributing forces like Disney, American Express and PepsiCo, dives into a number of work activities that should begin reaping significant rewards for our region, and by extension, the world. From delivering high impact projects to creating rigorous collaboration and partnerships; from establishing a sustainability leadership training program to increasing membership, locally and across the globe, Nexus North is on the cusp of catalyzing solutions to the epic challenges and opportunities that exist in Wood Buffalo. Most relevant to the communication issue that was very pronounced last night, trying to "bring it down," as Councillor Meagher suggested, is going to be one of the key activities going forward. What is the North Star that we are all shooting for? What is the flag planted on top of the mountain and can we all see it? 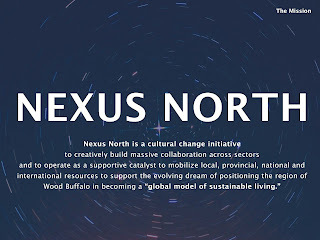 Councillor Burton brought up one concrete example of how Nexus North is already creating value around the activation of Arts Council Wood Buffalo. 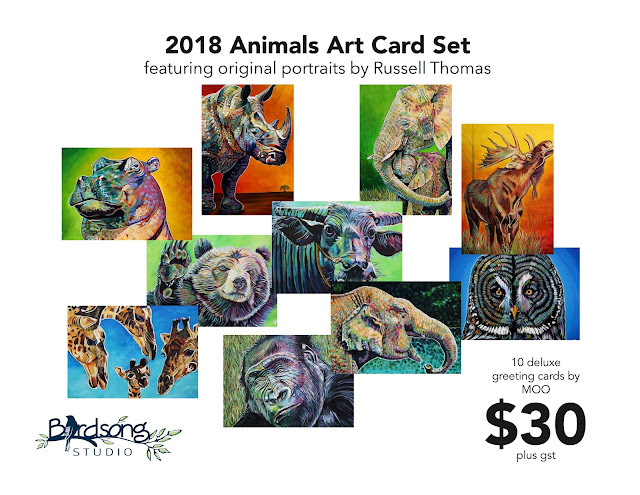 "All of a sudden, we have access to people like Charlie Cannon (who presented to Council last night, along with Seth), who have a breadth of knowledge in the arts." She was absolutely right, as we are trying to do something in months which normally takes years. Being able to tap into global thinkers and best practices enhances our ability to move forward quickly, and with maximum impact. 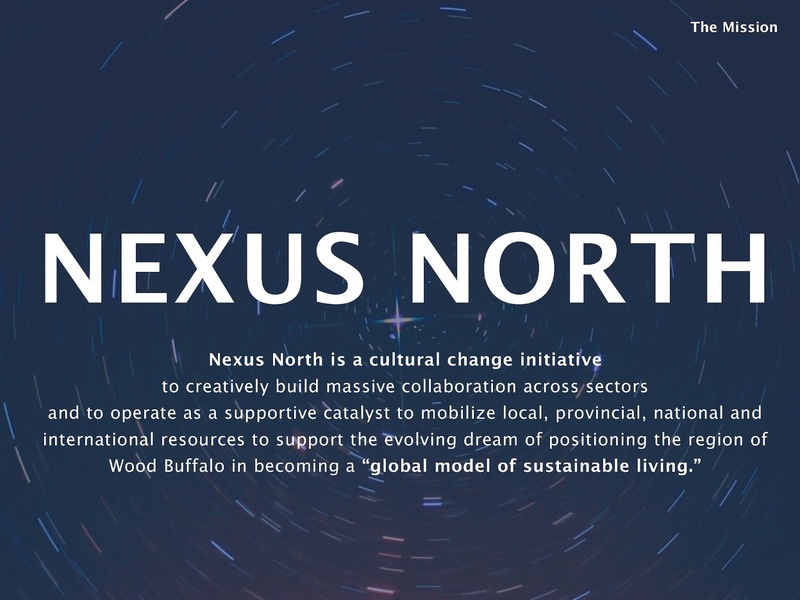 Nexus North and projects like Social Prosperity Wood Buffalo, which focuses on the social profit sector, are hard to understand and nail down because both dive into the world of complex systems and issues. The latter has struggled from the very beginning to be understandable - to be understood - though the work it has accomplished in the sector is substantial and transformative. I'm not sure what the work of Nexus North will produce. Perhaps that's the beauty of it? Perhaps the fact that the end state has not been defined is the best indicator of its intrinsic value and limitless potential.